OKLAHOMA CITY - The threat of severe weather across a section of the Midwest has brought a new round of warnings from weather forecasters. The Storm Prediction Center in Norman, Okla., said Sunday will possibly bring more powerful storms than have already swept much of the nation over the weekend that could include tornadoes and even larger hail from North Texas to South Dakota. Meteorologist Scott Curl with the National Weather Service's Norman office said there could be "quite a bit" of severe weather on Sunday afternoon and into the evening. CBS News meteorologist Jeff Beradelli reports the likeliest time for tornadoes will be around then. The highest potential for severe weather on Sunday will be in Arkansas and portions of Oklahoma and Texas. A secondary threat area will be from eastern Nebraska into Iowa. 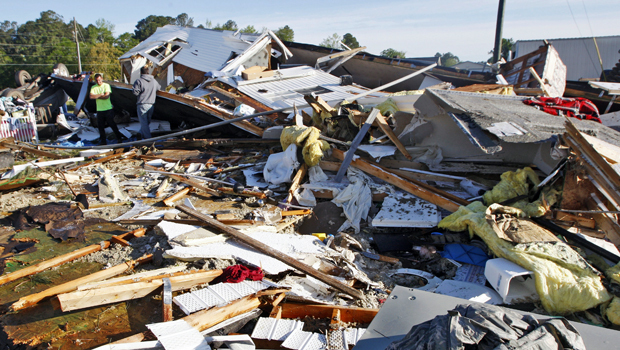 Multiple tornadoes packing winds of more than 111 mph damaged more than 200 homes on Friday in North Carolina. Sixteen people were taken to the emergency room when the storms passed through around 7:25 a.m. Friday, according to Beaufort County Emergency management Director John Pack. In the central U.S., organizers of outdoor events have kept a watchful eye on weather conditions. Organizers with the Oklahoma City Marathon, set for Sunday, urged runners to be aware of the race day alert system intended to warn participants of impending bad weather. Three shelter locations have been picked to house runners and spectators if the stormy weather moves through. In northwest Arkansas, the University of Arkansas baseball team played a doubleheader against Auburn Saturday afternoon instead of a single game and canceled a game scheduled for Sunday.